Nyima Kunga, board member of the Gesar Fund and contact of the local Dönda, Yushu and Xining Gesar Team received his China visum this week. This means that also this year we can execute our Checking Our Aid Campaign. The building of the Gesar Community Centre is continuing and with the addition of a stupa and praying-wheel house it is getting more beautifull and more functional. The General Store, after a successful start five years ago, is gaining less money due to problems with staffing the store. The local team continiously is monitoring the situation and making changes if necessary. The health projects are doing fine. Many nomad adults and children are tested on TD and hepatitis. If needed they are sent to a Chinese Peoples Hospital for free treatment. Our ambulance goes to the very remote areas and also there tests various nomads. Since two years also all students of a secondary school in Chindu are tested. In return they are asked to carry out simple household jobs or give education about disease prevention. 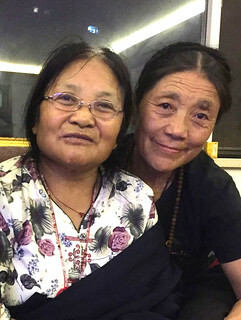 Last year, after the Checking Our Aid Campaign, Nyima gave an interview with the Shambhala Times. He told he was happy that after all these years the self-sufficiency under the nomads starts bearing fruit. The nomads slowly are getting confidence they themselves can start initiatives and actually make money and even can become self-supporting. We remain critical though. The General Store has proven that circumstances quickly can change. Not only external circumstances can change but finding nomads who remain motivated in long term can be a challenge. Nonetheless we keep developing new plans.The latest plan is to buy Yak cows for nomad families who do not have cattle anymore. We will keep you posted! Next update will follow as soon as Nyima contacts us! This Monday Nyima arrived in Xining, China. To let his body adjust to the altitude he will remain for three days with his family and then drive in 12 hours to Dönda. There he will talk to the local Gesar Volunteers and of coarse with the nomads and representatives of their families. First we would like to get the Gesar Store up and running again as it did some years ago. Then we would like the Gesar Community Centre become more a centre than it is now, attracting more visitors and thus generating more money for the nomad families. This goal has been one of the reasons to build a stupa and to install a praying wheel. Also the self-sufficiency of the nomads will be a topic. What is the status? What can the Gesar Fund do to support initiatives which have not been realized yet? The health projects are a success. Are there possibilities to expand this success and reach out to even more nomads? The education project of the Konchok Foundation? What is the status? Can we make an even more meaningful contribution? We wait for the first photo's and the first news! 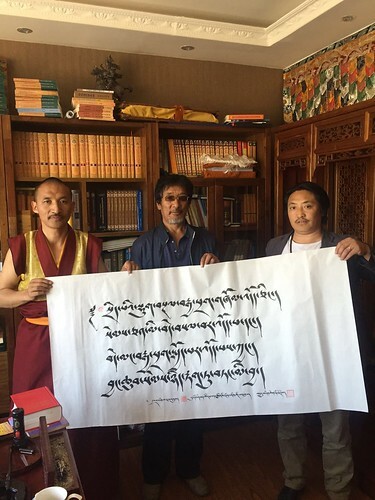 Another new activity in the Gesar Fund Fighting Tuberculosis Project! After a visit to Dönda (more in an update to come, we're waiting for the photo's) Nyima travelled to the Pacha Monastery. As the Gesar Fund had been so succesfull in expanding or Healthcare activities, the idea arose to search for more locations for a largescale implementation of one of our health projects. In 2016 the secondary school of Chindu took profit of this expansion, this year Nyima has - on behalf of the Gesar Fund - donated 5000 euro to the Pacha Monastery to make it possible that every monk, novice and passing nomad could get a TB-test. As we mention on our Gesar Fund Healthcare page positive tested individuals can have free treatment in the People's Hospital. However, for medication has to be paid!These costs will be paid by the Gesar Fund. And of course the Gesar Ambulance will be used for the x-rays. On the photo you can see the official flag (painted by the abbot) on which is stated that the monastery has received an amount of money equal to 5000 euro which will be spent on Fighting TB. The abbot thanks the Gesar Fund onbehalf of all monks and the people of Tibet. The Gesar Fund can do what we do because of generous donations. So please donate via our Donation-Page. Also small donations are very welcome!!! Chengdu county bacterial epidemic !!! In Chengdu county a bacterial epidemic has occured the last month, caused by decomposing dead animals. As dead animals decompose, bacteria that may normally be contained within the animal's body can be released, exposing people to potential disease-causing pathogens. As disposal of cadavers often is not possible due to the vastness of the valleys with hardly any inhabitants, with normal circumstances (the extreme height and the extreme dryness of the air) the cadavers will be quickly embalmed. Alas, as happens once every ten years, this time somehow the dead-animals-bacteria 'escaped' and form a risk for the human population. 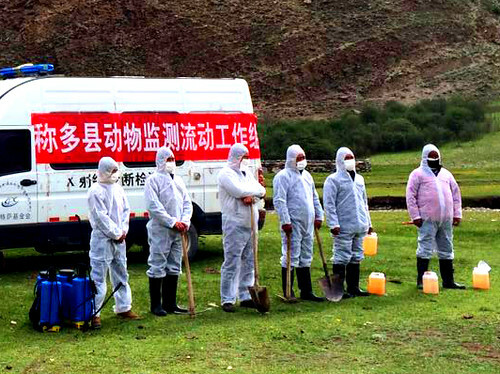 The whole Chendu country has been sealed of for three weeks now, and healthcare teams were send into the mountains and countrysides to spray anti-bacterial fluids. The local Gesar volunteers (including doctors and nurses from the Peoples Hospital) also were alarmed and used the Gesar Ambulance to travel to all Gesar locations to decontimate water supplies in and near the villages and hamlets. Found dead animals immediately were burned. The nomads were investigated if they were infected, and if so, anti-biotics were provided. 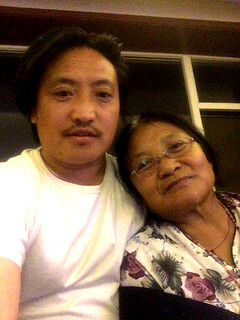 Nyima returned from Tibet and informed us about the booked results and the latest developments. As told in a previous update, we have expanded out Fighting-TB Project with another school. 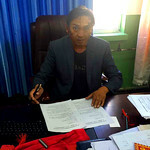 On the photo underneath you see the brand new director of the Orphanage School signing the contract in where the Gesar Fund commits itself to delivering aid and financial support regarding medicins. Gesar Fund's aid consists of testing on TB and other infectious deseases. In case of positive results students are told to get treatment in the Chinese Peoples Hospital where treatment is free-of-charge (but medication is not). 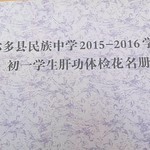 The signing of a contract between the school and the Gesar Fund is of great symbolic value. Each year the contract will be renewed. The General Store does not make much money. The current manager is not capable to make the store a kind of centre where people gather (and spend money). This has been going on for two years now, but the local volunteers wanted to keep the shop open as long there was a possibility that the new highway would be build nearby. Alas! This summer has been decided that the highway would be build out-of-center. Nyima now has decided to move the shop to the Gesar Community Centre were are much more visitors (allthough father away from the highway). In the past winter in the Community Centre started a new initiative: nomads created small souvenirs from yak-hair for the transit tourists in Dönda. 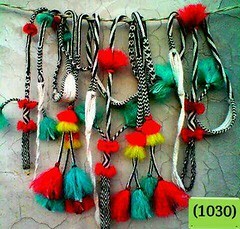 The nomads were very enthousiastic during the making of the souvenirs and hoped on good sales this summer. Alas! This summer it became clear that the new highway wont be close to the centre of Dönda. So the General Store where the souvenirs were sold did not get visits of transit tourists. We now will wait another year to find out if more changes in the highway project will arise. Only then we can determine were and how we can continue the sales. Gesar Fund continiously works on alleviating poverty, stimulating education and fostering health in Kham and Chengdu. In alleviating poverty we try to make the nomads self-sufficient by stimulating new initiatives and if necessary backing them up with financial support. Circumstances change continiously in contemporary China. This summer this caused we had to pause the initiative of making and selling souvenirs by the nomads. On the other hand we were able to add another school to our Fighting-TB project and we were able to offer TB-tests to the Pacha Monastery.! We continue in supporting the nomads and allways will cope with changing circumstances as a courageous shambhala warrior! Your support will remain essential! On our Donation Page you can support us! The money is very well spent and as the Gesar Fund only runs on volunteers there is no overhead! Underneath you will find hyperlinks to previous Checking our Aid campaigns. Each campaign consists of some six messages directly received from Kham.